On June 29th at 10:30 pm, while I was out enjoying an evening jog, I tripped and broke the 5th metatarsus (the main bone of the pinky) of my right foot. On August 8th at 10:00 am the cast was removed. 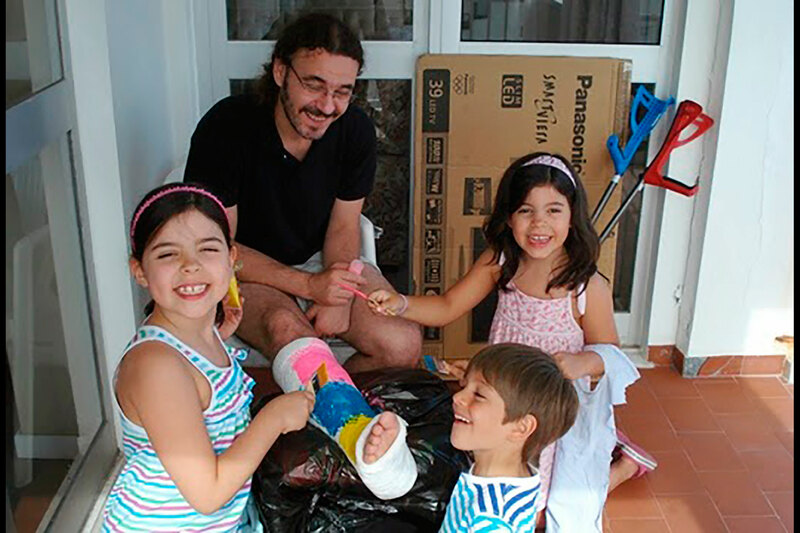 That’s a photo of my nephews painting my cast. The following are some of the things I learnt during those 39 days, 11 hours and 30 minutes. Performing everyday activities took a little longer and was a bit more complex to carry out. In practice, this often meant it was harder for those around me to go about performing their own everyday activities. Using a cast helped me learn to consider beforehand whether I would be of greater help staying out of the way instead of getting in the middle and making things messier. Often, the best way to help was just not getting in the way. I extend this to other areas of life. Though I may want to lend a helping hand with my advice or expertise, it is wise to first ask whether this will actually make things better. At times, staying still or silent is the best option. I also got used to the idea that some things I would just not be able to do on my own. For ex., I could not walk around with our daughter, Irene. For five weeks, I was a “sitting daddy” and relied on others to attend to many of Irene’s needs. Life is a circle of interdependence: though autonomous, we rely on others and the services they provide for large amounts of our happiness. Not being able to take a walk, run, swim or shower normally were tough for me. I even had dreams where I’d be walking and then noticed in shock that I still had the cast and shouldn’t be putting my foot on the ground. One the principles we use in my conflict resolution seminars is that a conflict with no solution is a solved conflict. Accepting my limitations proved to be a challenge. Once accomplished, it’s also a blessing. My experience tells me it is not empathetic to share your ”horror” story with someone who is going through one of their own. They don’t need to hear the ups and downs of your experience. It doesn’t help cope. On the other hand, people were very kind. Just an example, when my wife, Claudia, Irene and I travelled on vacation, we anticipated a stressful and rough ride. Not true. The services for passengers with mobility constraints were great. At every airport, we were assisted with great effectiveness and extreme kindness, at no extra cost. I take this opportunity to express our gratitude to all those who helped us. A cast taught me that vulnerability can bring out the best in those around us. Another aspect was that my wife had extra work on her hands. As the days went by, I could see the fatigue growing, and an increasing effort was required to endure. But she endured. And then she endured some more. My love for her has grown. I am fortunate to have seen that love fuels faith and strength in tough times. Finally, the day I had the cast removed I noticed that my right leg was very thin. Even some of the hair on my leg had died (of asphyxiation?) and fallen off. This made me think about how we, as humans, are not built to be trapped. Whether a relationship, the past, a job or even a dream, whatever imprisons us, weaken us and eventually kills the life in us.